I just brought my 2018 TLX in for an oil change, and I let the service adviser know the external temperature display in my dash has not been working ( it always reads -40 degrees). At first, she told me they techs were too busy to check that on a Saturday, ( I understand its a minor issue). When the car was ready, she told me the external temperature sensor was broken, and it would be $255.00 to replace, and its not covered under warranty, car has 26K miles. Does anyone know where the sensor is located? Is it an easy fix? I'm mostly concerned about when I turn the car in at the end of the lease, will I be dinged for that repair? It should be behind the front bumper or grille. Quite a markup on that part and 0.5hrs to replace, but that’s beside the point. Did you ask why it’s not covered under warranty? You’re leasing and you’re within the comprehensive warranty period. It stopped working, so it should be covered, no questions asked. I’d be cautious with and around that dealership, service department and service manager. The dealership told me it would not be covered under the comprehensive warranty because the sensor was damaged possibly from debris on the roadway. I don't buy that since I specifically remember the temperature readout did not work one morning when I started the car. Since its a leased vehicle, I assume it will need to be fixed at some point. That is pretty much the only leg on which to stand for not covering it (damage or neglect by you). Unless you crashed into something, their story doesn't smell right. Ask them to show you. I doubt it was put anywhere near the line of fire from rocks and debris. You shouldn't have to pay for that. 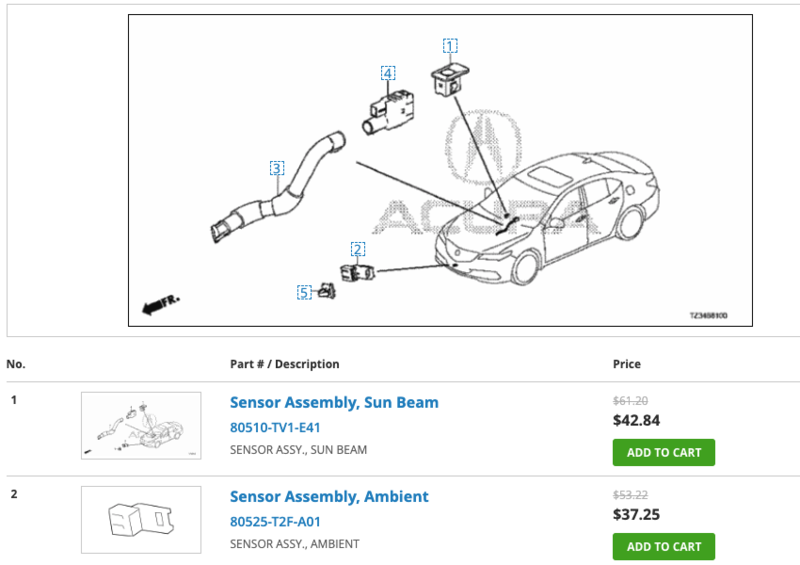 I doubt Acura placed the temp sensor in a place where it'd easily get damaged by debris. Agree with the above comment and ask the dealership to show you the damage and call the Acura Corporate number to complain if they do not resolve the issue.